These Procedures are related to the Policy for University Policy Development (“Policy”) found in the Policy Library. See Policy for the definitions of any capitalized terms contained in this document. The Policy Initiator, together with the Vice President, after establishing a need for a University level policy or substantial current policy revision, shall draft a proposed revision or policy. The draft should follow the attached Policy Template form. The Policy Initiator and Vice President will submit the proposed revision or policy to the PAC for review. The Policy Development Proposal Form is a resourceful tool that should be used to assist when drafting the proposed policy. After review and input, the Chair of the PAC will submit the draft policy to the Vice President of University Relations for editing purposes. University Relations will return proposed policies to the PAC if there are any edits. Immediately thereafter, the draft policy shall be published on the Policies Under Review page on MyArcadia by University Relations. Notice of the placement of the draft shall be communicated to the University community by the Chair of the PAC via email as soon as the draft is posted. The draft will remain posted for a period of ten days during which time the PAC will accept comments. The comments received by the PAC are advisory in nature and will not obligate the PAC or the Policy Initiator and Vice President to make any changes in its recommendations concerning the policy under consideration. After considering all comments, the PAC, in conjunction with the Policy Initiator and Vice President, will finalize the draft of the policy. The Chair of the PAC will send a copy of the resulting final draft to the Executive Review Committee for review and consultation with various stakeholders regarding the proposed policy’s likely impact on the members of the university community. The Executive Review Committee will have 45 days to review any draft presented by the PAC. The Chair of the PAC will make changes to the policy based on the feedback of the Executive Review Committee. Once a final draft is approved, the Chair of the PAC will forward the resulting draft to the President’s office for final review and approval. If the President approves the proposed policy, it shall be delivered by the Chair of the PAC to the Office of the General Counsel for publication in the Policy Library. If it is not approved, it shall go back to the Policy Initiator and Vice President and PAC for further review and input. All parties engaged in the review process shall use their best efforts to review the document within a reasonable timeframe. The Vice President will, after the new policy has been added to the Policy Library (i) establish procedures for the new policy, (ii) communicate the new policy to the University community and begin any training or other necessary steps for implementation, (iii) monitor compliance and facilitate remedies for noncompliance as directed by the policy, and (iv) maintain records created during the policy development process for four years. The Chair of the PAC will ensure that all signed University Policies will be maintained in the Office of General Counsel. 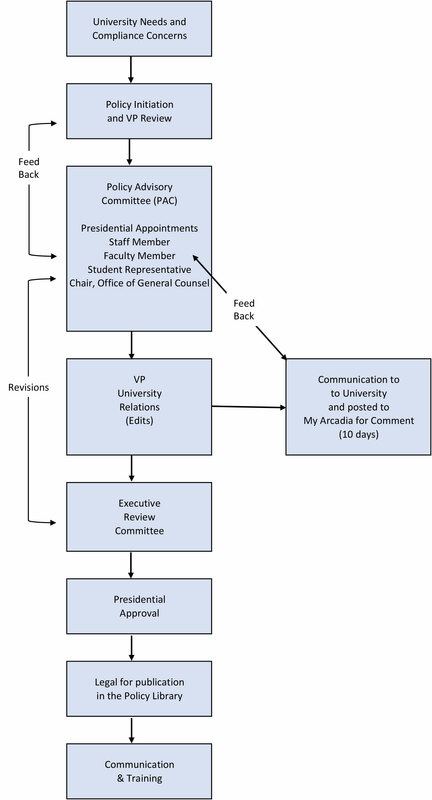 At a minimum, each Vice President must review each of its University Policies within three years of the date the policy goes into effect unless sooner required by a change in law. At least 60 days before the next scheduled review date, the Chair of the PAC will notify the Vice President that it must review the policy in question, and (a) if the policy requires no substantial revision, notify the Chair of the PAC in writing that the policy has been reviewed and remains in effect; or (b) if the policy requires substantial revisions, initiate this policy development process. Minor changes may be made to a Policy without it going through the policy development process if the change (i) is not substantive, and (ii) does not modify the intent, meaning, or focus of the policy. The decision as to whether those criteria are met will be jointly made by the PAC and Vice President. If a proposed change is determined to meet both criteria, the revision will go through an expedited process of review by the PAC. Changes in procedures would not have to follow the policy development process and may be altered by the Vice President, as needed. The PAC provides resources on the PAC website to assist in the policy development process. The Policy Development Proposal Form is designed to assist the Policy Initiator or Vice President in determining the University’s need for the proposed policy, whether the risk or value is sufficient to warrant the dedication of resources needed for policy development and management, and whether the purpose and goal of the proposed policy may be accomplished in a different way. Under special circumstances, Policy Initiators and Vice Presidents may request an expedited process by contacting the Chair of the PAC. Special circumstances may include a change in federal or state law, a significant and immediate financial opportunity, or a major institutional risk. A standard policy format ensures clarity and consistency. Although not all policies will contain all of the format elements, University policies will be written and maintain the format described below. Download Policy Template. Scope: Identification of parties governed by the policy. Policy Statement: Purpose of the policy and the statement of philosophy, position, rule, regulation or direction. Policy: Description of the actual policy covering topics which include: duties assigned to responsible parties and other parties as necessary; other information specific to a particular policy subject as needed; and a description of the compliance review process and specific authority to impose penalties or other remedies when noncompliance occurs, if applicable. Definitions: Meaning and interpretation of terms used in the policy. Effective Date(s): Initial effective date of policy, and latest revision date, if applicable. Signature, title, and date of approval: required for initial approvals and all subsequent reviews and updates. NOTE: For Arcadia University policies that predate this policy, the format described above should be written in the approved policy format within two years. Academic/Research Policies: Policies that relate to teaching, research and outreach. Employment, Benefits, and Workplace Policies: Policies, rules, related procedures and information impacting working relationships with the University for all employee groups. Ethics, Integrity and Legal Compliance Policies: Policies concerning appropriate conduct and/or compliance with the law. Facilities, Equipment, and Property Policies: Policies concerning use and care of University property. Financial Policies: Policies related to accounting, budgeting, procurement, travel and other financial functions. Governance Policies: Umbrella policies that provide the framework for administration to implement and comply with the intent of the Board of Trustees. Information Technology Policies: Policies that cover systems, access, data, and related issues. Operational Policies: Policies that are of a general administrative or operational nature. Public Safety and Environmental Health and Safety Policies: Policies concerning security and safety of faculty, staff, students, and guests. Student Policies: Policies applicable to status as a student.